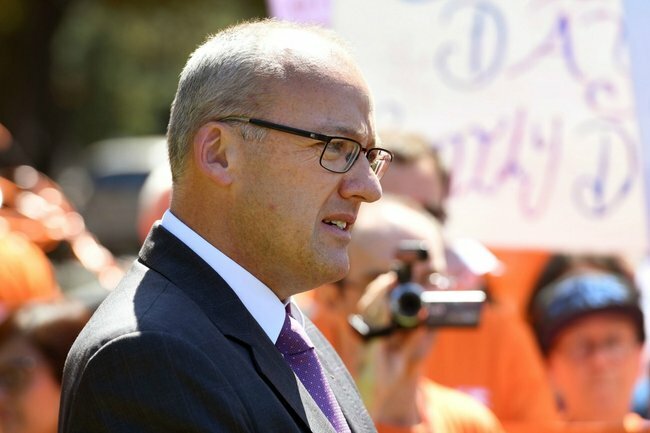 Luke Foley drops legal treats against Ashleigh Raper. Luke Foley has dropped his legal threat over an ABC reporter's sexual harassment claims. Former NSW opposition leader Luke Foley won’t proceed with legal action against the ABC and a journalist who says he sexually harassed her, saying he doesn’t want to put everyone through a protracted court battle. Mr Foley resigned as NSW Labor leader earlier in November after ABC journalist Ashleigh Raper alleged he groped her at a 2016 parliamentary Christmas Party. Upon his resignation, Mr Foley threatened to sue Ms Raper and the public broadcaster for defamation but on Wednesday confirmed to AAP he no longer planned to proceed. “I’ve decided not to proceed with legal action,” Mr Foley told AAP in a text message. Mr Foley resigned as Labor leader on November 8 and later confirmed he would not re-contest his seat of Auburn at the March 2019 election. He has been on leave since. The sexual harassment scandal was sparked after Corrections Minister David Elliott aired the allegations under parliamentary privilege in October. Ms Raper then issued a statement in early November to “set the record straight” after Mr Elliott’s comments. “He stood next to me. He put his hand through a gap in the back of my dress and inside my underpants. He rested his hand on my buttocks. I completely froze,” Ms Raper said in the statement. She said she did not initially make a complaint for several reasons, including for fear of losing her job and the negative impact it would have on her family. Ms Raper said the opposition leader had called her in the days before she issued her statement to apologise, saying: “I’m not a philanderer, I’m not a groper, I’m just a drunk idiot”. She also said he promised to resign but did not follow through based on legal advice.